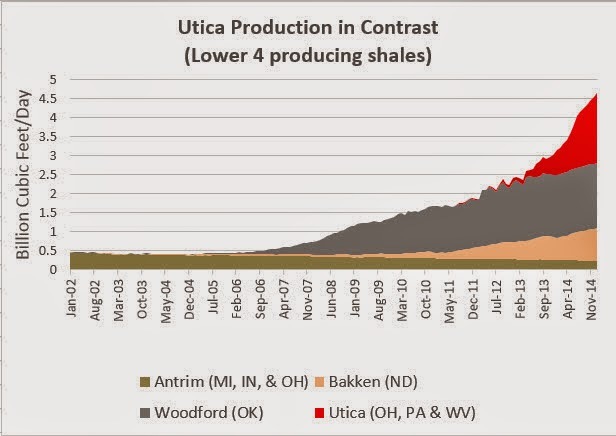 In an earlier post I selected the top 5 gas producers from Q1 2014 in Ohio's Utica Shale and followed their inevitable production decline through Q2 and Q3.Now that Q4 2014 data is available lets look at how the same wells have continued to perform over time. Three of the wells showed production of more than 1,000,000 Cubic Feet in Q1 2014. Production in all five wells has declined by more than one-half from Q1 to Q4 2014. Many of us have seen production decline curves quite steeper than what is shown below, this is only because here we are looking by the quarter. If we had day-to-day data I suspect that production type curves would show the steep decline in early days rather than averaging decline in three-month time spans as below. 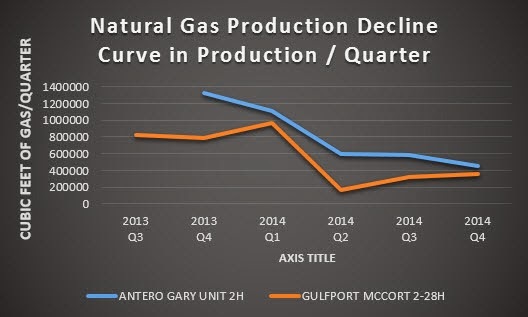 The Gulfport McCort well had its first full quarter of production in Q3 2013 and the Antero Gary Unit 2H well had its full quarter of production in Q4 2013, so we are looking at different points along the production decline curve and the "Production % Sustained" numbers in the first chart below do not reflect a complete decline rate curve and can not be compared directly. 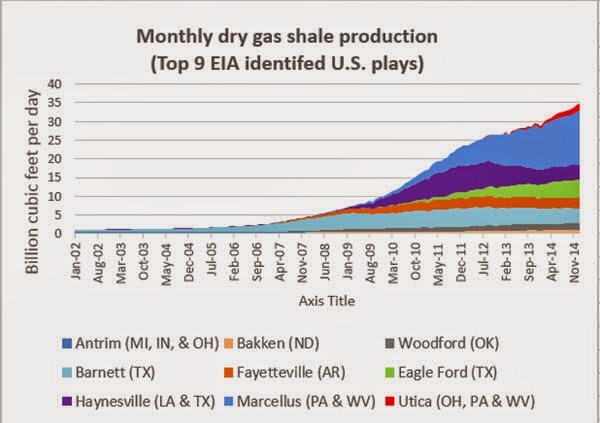 The purpose here is to simply show declining production of selected "Top 5" wells from Q1 2014. And while focusing on the five wells below, it is worth noting that two ECLIPSE wells showed 1,833,001 (19,923/day) and 1,895,281 (20,600) cubic feet of production in Q4 2014. These two remarkable wells will be watched closely for decline rates over time. (Total % decline in the graph above is based not on total production during the quarter but on production/day during the quarter, taking into account the number of days that a well is listed as producing, which can vary, as noted with the McCort 2-28H well which showed as producing for just 32 days during the three months of the Q2 2014). 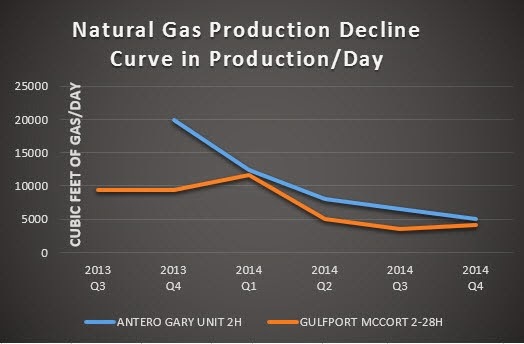 The McCort 2-28H well's 32 days of production during Q2 2014 contributed to an abnormally steep decline in total production in the quarters from Q1 to Q2 but understandable given the reduced days producing. The Gary Unit 2H well showed 74 days of production in Q2 and the other three wells showed 90 to 91 days of production in Q2. Q3 and Q4 production days were very similar for all wells. And while the Antero Gary Unit 2H shows 40% sustained production from Q1 to Q4 (the highest of the five), it is important to note that the well was THE top natural gas producer in Q4 of 2013, showing 1,329,318 Cubic Feet of production (19,840/day on 67 days of production) compared to the 1,115,801 and 12,398/day number for Q1 2014 below. From Q4 2013 to Q3 2013 the well sustained production at 33%. When a well enters production is an important factor given the high initial production decline rates. As a result, the 40% production sustained number is skewed by the fact that we are looking at a production curve that is further along and not as steep as initial decline. Similarly, McCort 2-28H also showed significant production in Q4 2013 with 792,076 Cubic Feet (9,420/day on 84 days) and 826,255 cubic feet of production in Q3 2013 (9,389/day on 88 days), with only 5 days of production in Q2 2013. So excluding the brief production in Q2 2013, the first four months saw production go from 9,389/day to 5,038/day for a 53% production sustain rate, very high in comparison. See McCort and Gary Unit wells decline curves below. Again, the McCort 2-28H well produced for only 32 days in Q2, accounting for the steep production decline, which recovers in Q3.